I ran into a very confusing issue where pre-processor symbols were not being defined when building via xbuild. My investigations uncovered the fact that the the symbols defined by default when created within Visual Studio for Mac were not all propagated to the corresponding .csproj. Check this out. Only the "DEBUG" symbol is defined in the .csproj file. And in Visual Studio, I have no idea where it's getting the UNIFIED and MACOS symbols. To get them into the .csproj file without manually editing the .csproj file, I added a test symbol in both Release and Debug configurations within Visual Studio. And then I then removed the test symbol. I've attached my barebones Mac Library project. That's odd. I did note that if I add a new compiler symbol into the define Symbols field of the Compiler settings page then the new and the existing symbols do get propagated to the .csproj file. Thanks Jon - yes that's what I did as well to get them propagated. It was quite a "odd" gotcha! 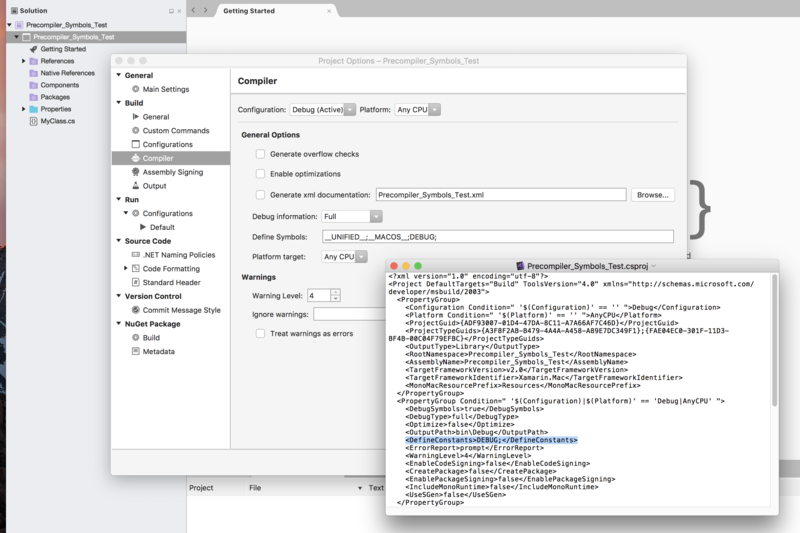 I have some issue with regards to Build configurations & compiler symbols I have created new build configurations - DEV, SIT, PROD & also defined the compiler symbols for particular build configurations in VS for mac. & written below mention code, which is not working as expected. Can you please help me on this? #if !STORE //Do Something #endif When I build using Store(Release) configuration I expect that "DO SOMETHING" should not be executed.